The waiting list is $200. Put that down now and it reserves your choice of every litter born in the order the waiting list deposits are received. 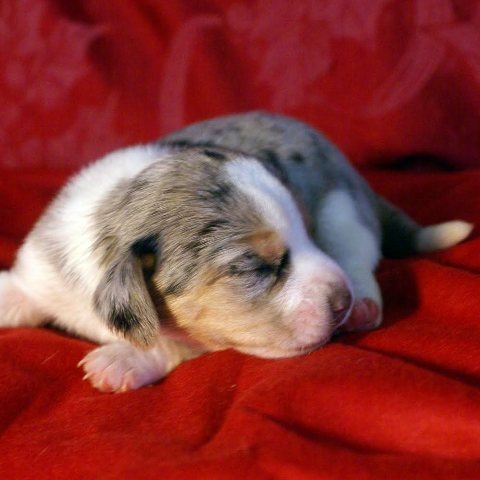 You get to preview photos ahead of time before puppies are offered to the public. 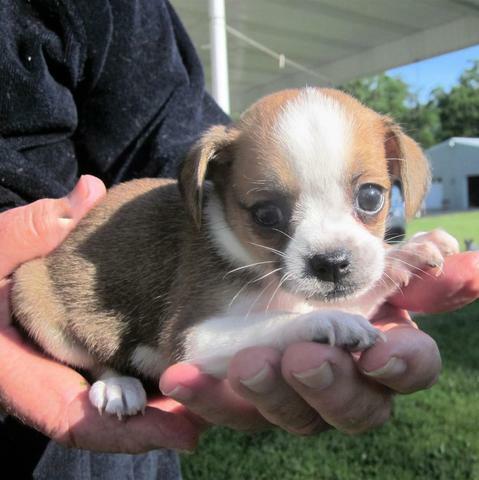 The earlier you send your deposit in, the higher in priority on the list to select your favorite puppy from the litter. At the time you are given photos to choose the specific puppy you may reserve it with half down (the $200 goes toward that half down). Then the remainder is due when the puppy is 8 wks. old. Your chosen puppy ships after that. Email:therapypuppy@gmail.com to hold your place on the waiting list. Fill in the blanks to get information about reserving your puppy. Our Present Waiting List is still growing! 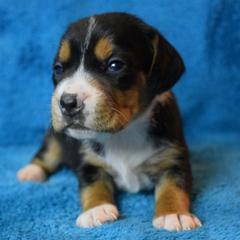 #1 Tara is waiting for a female puppy that closely resembles Lyric in color and size. We have three little girls who absolutely fell in love with Lyric when they saw her on the webpage. We will be ready for our new family member in late January, early February. #2 Kim is waiting for a harlequin or one with 'lots of spots'. I have my own business—so the new beagle will not be left alone all day—she will come to work with me while she is young. 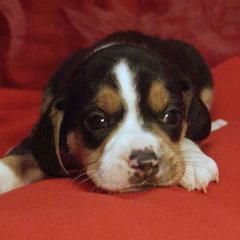 #3 Connie is waiting for a "small beagle to be my forever companion." I am widowed and....We have a dog and cat that need a new little sister....affectionate, loyal, playful! #4 Scott is waiting for a "funny friendly family dog that is good with our pug." We want a female ... beagles or other dogs. We'd be interested in the Rottiebear breeding program. #5 Ashley is waiting for a beagle that is "sweet and easy to train". We recently dog sat for a someone who got their puppy from you all and we fell in love! He/she is comfortable in social situations and loves to meet new people. He/she is not "yappy" but has a calm and loving demeanor. 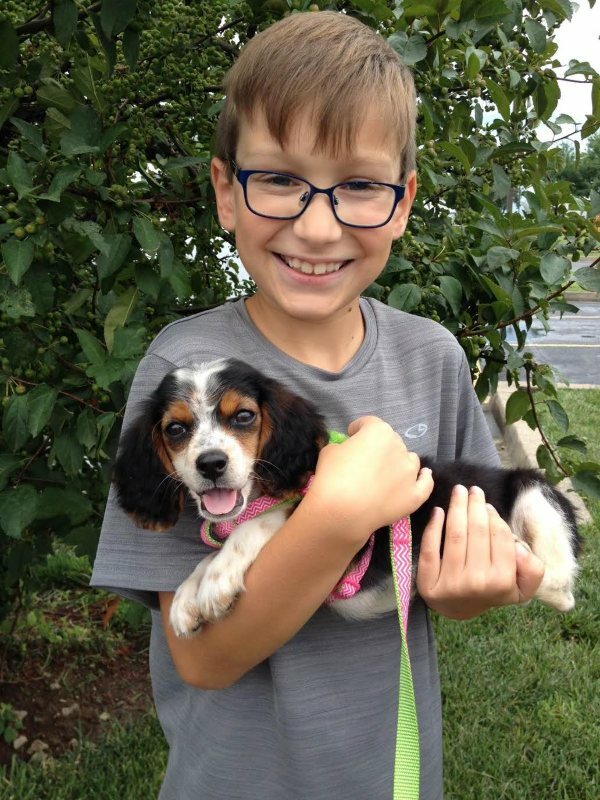 #8 Barbara--purchased Sunlight, now "Zoey"
Would like a smaller puppy such as the pocket beagle in either brindle or a nice tricolor. I'm very picky with dogs and this one seems to be the perfect choice! Also, would prefer a male. It is for my daughter. She is a extreme dog lover as is are entire family. She plans to wait until she goes to college. We have a full-time nanny that won't work around animals due to allergies. She has been with us for 3 years. Our last child will be starting school in the Fall 2017; therefore, we will part ways with our nanny and be able to get our puppy. #4 Stephanie is waiting for a small pocket beagle estimated to weigh 5 lbs. as adult. We like the look of the tricolor beagles the best, but bicolor is a close second. We don't think we have a preference on gender. 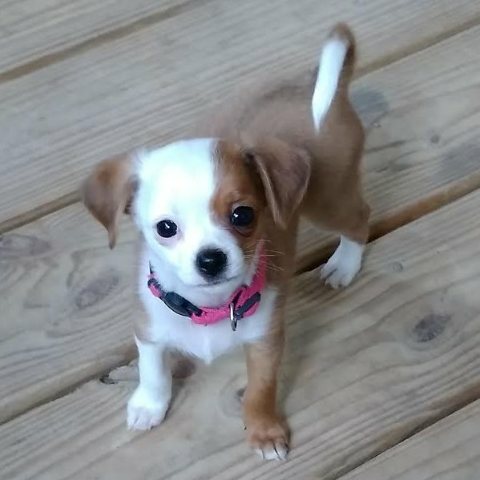 This will be our family's first dog, so we are very excited! If you can tell as a puppy if it will be easy to train, that would be helpful for us since we are novices. #5 Brenda is waiting for a female no bigger than 6-8 lbs. harlequin, blue eyes! My dream dog would have a very affectionate happy personality and be very attached to me as she will be my emotional service dog as prescribed by my doctor. She will go everywhere with me and never be left alone. [Was #5] Mike is waiting for a male Rottie or Boxer Bear. We want short hair. Our daughter is getting impatient....We are excitted to add a puppy to our home to join our two cats. [Was #9] Amy is waiting for a male no bigger than 10-12 lbs. tricolor for June 2017. Our kids have been asking for a puppy for forever and they fell in love with the pocket beagles! This will be our first family dog and we're so excited. He will be so loved! DOB 02/10/17 Weight 1 lb. 10 oz. [Was #6] Brad WAS waiting for a male tri-color pocket beagle. I don't want one too small but was thinking more along the lines of a 15-20 lb size. Congratulations to Brad for purchase of Chewie! Would like a playful, friendly puppy that we can train and will be a good addition to our family. Congratulations to Devi for purchase of Chaz! [Was #6] Chelsea WAS waiting for a very small tri-color pocket beagle. 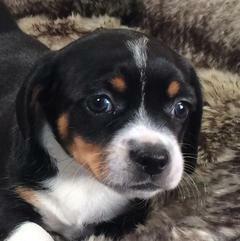 My kids are dying for a very small tri-color pocket beagle. This is our first dog but they have been asking for years and years. I have finally agreed because how can you not resist after seeing your photos. Like Angle, Jasmibella, or if two tone then like Sam or Stockings. This will be my 11, 9, and 6 year old Christmas dream come true. Congratulations to Chelsea for purchase of Esther! Laura WAS waiting for a Queen Elizabeth Pocket Beagle. My seventeen year old beagle passed....I raised her from a baby. I prefer a female. Georganna and Jim WERE waiting for a small female tricolor pocket beagle. We are very excited! 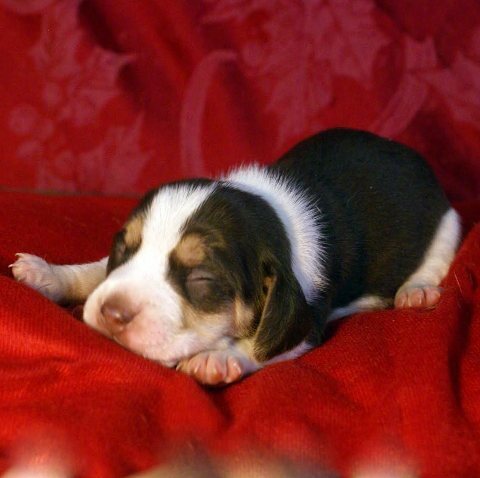 This will be our first beagle, although I have wanted one since I was a kid. So, we might need a little help in choosing the best, and luckiest little beagle ever that gets to move to Idaho and become part of our family. I'm thinking we will be pretty lucky,too!! This Waiting List has ended! #1 is still waiting for a puppy. We have been interested for quite some time and now we are finally ready for a furry family member! 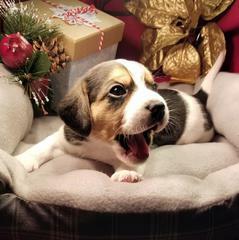 We are looking for a small female Beagle - either classic tricolor or Silver Harlequin tricolor. We would prefer under 14 pounds. Sweet natured, even tempered, easy to train, a big cuddler but also ready to play with my 8 year old son. We'd prefer a puppy that is ready to come home sometime in the fall. Congratulations to Amy and Son! Good Reference: 07/09/16: We are in love with this sweet puppy!! My son named her Lucy. She is so smart and sweet!! Traveled great in the car yesterday in a portable kennel. Pottying outside and letting me know when she has to go. Walking great on a leash and harness. Eating and drinking well. Vet check up was great too. Just needed another round of deworming. Thank you for her, she is such a blessing! 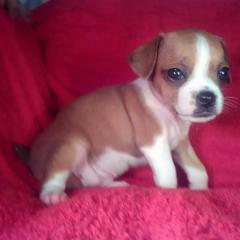 We have 3 kids who have been begging for a small dog for ages :). After extensive searching , and research the whole family loves the look of the Queen Elizabeth Beagles. We would prefer a dog on the smaller size - and the classic tri-color look reminds me of my own dog when I was a kid growing up. I will be the primary carer/trainer for the puppy when he/she comes to our house - and I will most likely be bringing he/she to work with me once trained. That said , we are looking for a dog that will be part of the family and not just attached to one of us. We have a somewhat hectic lifestyle - so will need to be able to go for short trips in the car pretty often and on longer trips when camping or heading to the snow for some winter fun. Classic tri-color. Approx 15 pounds. Physical profile same as fulll size Beagle. with longer legs. Able to be kept in apt. OK to stay home alone at times. I would like it to be as close to the standard Beagle as possible in color (tricolor) and appearance. I am looking for a male or female that would be available after Sept 1, 2016. This waiting list is fulfilled! After going over your web site again and again and will keep looking at it, it sounds like a Queen Elizabeth pocket beagle is the dog for me. My dream dog is a female and weighs in about 5 to 10 lbs., smaller is ok but not really more than 10 lbs. She is a playful dog and also likes to just hang out and be loved. She is kind, loving and a great companion for me and at the same time wants to be loved back. I would like her to have social skills so when I’m not at work she can go with me everywhere I go. And at the same time be ok with staying home when need be. Not too hyper as I had a “Jack Russel” for 14 years. An intelligent dog that I can house train, and also teach some tricks to. We prefer a male in the 10-12 lb range. We also prefer the longer-legged variety with the beagle ears and profile. 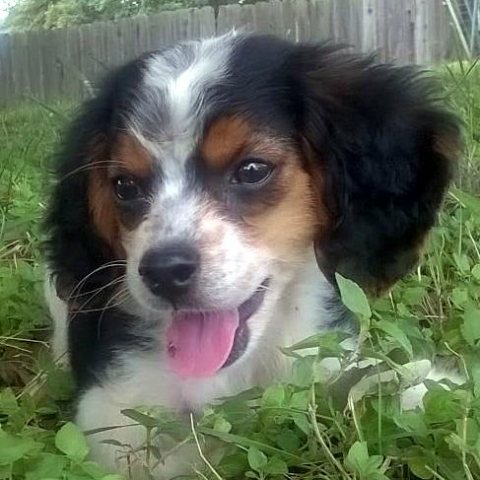 We like the tri-color classic look with more tan on ears and face and resembling a beagle. We also love the tan-on-tan and white coloration but are not locked into any one look. They're all quite lovely. We want a social dog whose moods and energy levels can match our own. We currently have a Jack Russell who is spirited and energetic but also relaxed and quiet when we are. We'd like a smart, inquisitive dog who is trainable. 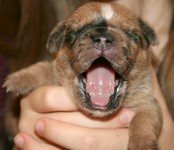 Puppies may be BOARDED longer at their breeder's home if you need this service. Each breeder charges individually for each day to cover food, cleaning, dewormings, and immunizations.